LSD is a potent hallucinogen that can cause several adverse negative health effects. Once tolerance develops, substance abuse treatment may be necessary. Although LSD is considered to be a non-addictive drug, people can become addicted to the sights, sounds, and revelations they experience while “tripping.” Users can develop both a tolerance and a psychological dependence to psychedelics like LSD. There have been documented cases of prolonged, intense use causing negative side effects such as paranoia or psychosis. 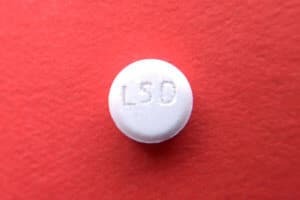 Lysergic acid diethylamide, commonly referred to as “acid” or LSD, is a psychedelic hallucinogen that produces changes in perception, sense of time and space, and emotions. LSD is active at very small doses (around 20 micrograms). The drug is most commonly taken orally, in the form of tablets, droplets, or most commonly blotter paper that is absorbed on the tongue and swallowed. Because is is typically delivered on small pieces of paper, it is difficult to independently assess what is an average dose. 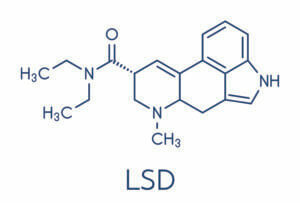 This is compounded by the fact that different individuals react to LSD differently. It is important to know that taking too much LSD can lead to feelings of dissociation and alienation. Research indicates that for most individuals, 20 micrograms of LSD is so small that it provides minimal euphoric effects. LSD is in the Schedule I of the Controlled Substances Act, the most criminalized category for drugs. Schedule I drugs are considered to have a “high potential for abuse” and no currently accepted medical use; however, LSD has been used in many therapies and shown some success in treating depression and anxiety. This is a very new avenue of research, but some believe that LSD also has the potential to treat PTSD and addiction. Although LSD has been known to have some positive side effects, the drug affects everyone differently and can produce serious physical and psychological effects. Tolerance to LSD develops quickly; if a specific dose is taken every day for 3 consecutive days, no reaction will occur by the third day. Users who abuse the drug regularly must take progressively higher doses to achieve the same state of intoxication that they have previously experienced. This practice is particularly dangerous, as when the dose amount increases, so do the chances of the user experiencing a “bad trip” and negative psychological side effects. Risk of overdose is very rare with LSD, and the risk of fatal overdose is essentially nonexistent with LSD. However, LSD is far from safe, especially due to the risky behaviors and side effects can occur. When users are on trips that can last for 12 hours or more, they often exhibit low inhibition or react to other effects of the drug, such as hallucinations. This may lead to dangerous actions and injury, along with social, legal, and professional consequences. LSD is also dangerous when mixed with other drugs, especially anti-depressants such as lithium. The most serious effects of LSD are likely to only happen after large and frequent doses, but can potentially be life-threatening, including: hyperthermia, suicidal thoughts, and psychosis. A 2008 study reported that about 3.1 million people in the US between the ages of 12-25 have experimented with LSD. According to the 2014 Monitoring the Future Study, 3.7% of 12th graders have used LSD at least once. Although LSD is physically non-addictive, users can become psychologically addicted to the drug’s hallucinogenic effects and suffer numerous consequences because of it. If you or someone you love is abusing LSD, there are multiple inpatient and outpatient treatment centers that can help. Many different types of therapy, including dialectical behavioral therapy, cognitive behavioral therapy, and lifestyle skills therapy, have been proven to help hallucinogenic dependency. Additionally, treatment methods such as relapse prevention, support groups such as Narcotics Anonymous (NA), and ongoing therapy have been proven to be effective. Don’t wait any longer, contact a dedicated treatment specialist to learn about your options today. Jena Hilliard earned her Bachelor’s of Arts degree from the University of Central Florida in English Literature. She has always had a passion for literature and the written word. Upon graduation, Jena found her purpose in educating the public on addiction and helping those that struggle with substance dependency find the best treatment options available.